The results and event report are in! Scroll below to read more. The A Grade entrants played a round robin in the group stages, followed by a third/fourth place playoff and a final. At the start of the day, Dan Soar looked fairly dominant over the other three players in his group, Jon Hand, Clyde Finch and Giles Clawson. However as the day went on the other three found their feet, increased their confidence and definitely rallied harder. Not quite enough though, as Dan soared to the top of his group, winning all his games. It was Clyde Finch of Spalding who contested the final with Dan, delivering a tight and exciting final. But in the end, Dan just had too much for him and it was Dan Soar who became the Cambridgeshire Open Racketball Champion for 2013! The B division was split into two separate grades, based on the preference of which ball players preferred. There were 12 players battling it out in the Blue Grade, starting off in four groups of three in group stages. Each player got two matches and then moved forward to a gold, silver and bronze knockout depending on where they finished in their group. Group winners went into the Gold knockout, and the four group winners were Mhairi Dougal (again), Mark Campbell of Peterborough, Paul Bryden of Cambridge and James Murphy from a bit further north in Chorley. Mark was pitted against Mhairi in the Gold Series Semi-final – he boldly stated that he had not lost to a lady since losing to Heather Simpson (that's the seventies or eighties!) and definitely drew the crowds to watch this particular match. And what a match! As the game went into a third set, each rally was met with ‘oohs and aahs’ from the crowd. Mhairi's competitiveness held out and she won 11-8 in the third. In the other semi James Murphy demonstrated his accuracy and control which overcame the raw power that Paul Bryden had used to bully previous opponents with. James was the eventual winner, taking the match 2-0. By the time the final came, Mhairi had played eight matches which unfortunately had taken their toll - even though she is a squash county champion and a fantastic player, James was just too strong at the final hurdle; he won the final 2-0. This was the most competitive grade, with 16 very good club players competing. The standard of matches here was very high indeed. The 16 players were divided into four groups with a round robin group stage providing each player with three games minimum. The top two players from each group went into a quarter final, when the games became a lot more serious. The first quarter final was between Peter Scott of West Norfolk against Vince Somers of Barnham Broom - old squash adversaries. Vince also played the over 50's competition and by the time this match came along his legs had had enough - Peter's excellent control saw him win 2-0. 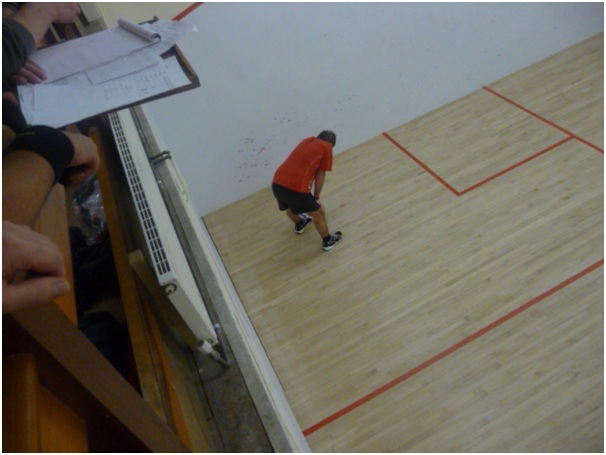 Ian Furlonger played his semi against Gary Slator and with a lot of quality racketball on show, it was Ian who won 2-0. Aaron Rudkin played Phil Perchard in the third semi-final; Aaron was fast around the court and was able to overcome Phil 2-0. This left the Bromley young guns Ian Scanlan against Billy Jones. As Billy had driven Ian to Cambs on the day, there were jokes that Ian would have to let him win or he was walking home. However, once on the court, it was game on. There were some gruelling rallies that both players were on the receiving end of, but eventually Billy came through two tough games to nil. Two very tight semis were played, with hard driving rallies, Ian beating Peter 2-0 and two very tight games were won by Billy over Aaron, with minimum margin. The final was between two players who had played a three setter in their group match. The rallies were long, not much was hit short, Billy's ball striking was impressive but Ian just refused to be beaten. The trophy was heading north after two of the toughest sets all day, but Ian persevered to win. All five ladies played each other in a round robin event, guaranteeing them four games minimum. This turned out to be a tight and competitive group. Wendy Bushell and Debbie Bowen fought very hard closely contested games but were edged out by Julie Manning and Mhairi Dougal to the top two places to contest the final. Steph Horner was giving racketball a go for this first time at the Cambs Open; whilst she adapted well, the experience of the other players was just a too much for her. She did however enjoy marking games as she then proceeded to mark any and every game available; we thank you Steph for your great support to the event! She received the "Most Likely to Improve" award at the end of the event and deservedly so. In the group stage Mhairi had beaten Julie 2-1 in one of the best encounters of the day. The final turned out to be a repeat between the two, with Mhairi's superior shot-making just holding out against Julie's determination, fighting spirit and greater racketball experience. Mhairi won the final 2 close games to 1. The over 50's groups were in continents. In the American group, James Murphy's doggedness and nous got him through some close matches and he didn't drop a game. In the Asian group, John Farrow lost an early match to Matt Boucher who then fell in his last match to Vince Somers, who then in turn lost out to John so that at the end of the group John found himself group winner - despite the loss of a tooth along the way (that's commitment for you!). Stewart Ferguson finished on top of a high quality group ahead of Peter Scott, and Mike English swept past Rennie Kapila to win the Antarctic group. This set up two of the toughest matches of the day – in the first semi, Stewart Ferguson ground past Mike English 11-8 in the third, with some terrific ball striking that despite Mike's willingness to chase everything eventually proved too much. In the second semi, John was 9-7 up with another in a series of long rallies presenting a forehand drive kill to move to match point that he tinned - the look skywards in exasperation was then followed by the almost inevitable climb back by James. He took the match 12-10 to meet Stewart in the final. The final showed Stewart looking fresh, fast and fit; unfortunately, the gruelling games of the day had taken their toll on his opponent James and Stewart managed to clinch the win. Young Leo Kitay beat of stiff competition from his sister Maya and the runner-up Jamie Homden in the final. Leo is only 11, but has excellent ability and is clearly well coached with good hitting ability. As he gets bigger and stronger he'll have a good future in both squash and racketball. Well done Leo! Many thanks to Simon Scott and Harrow Sports Equipment for sponsoring the prizes; there were some excellent rackets as prizes in the adult grades. Thanks also to Phil Wright of the Eastern Region of ESRA and Mhairi Dougal of Cambridgeshire County Squash Association for their continued support and encouragement to get the competition off the ground. Report compiled by Rennie Kapila, tournament organiser. Edited by Victoria Clark, UK-Racketball. The inaugural Cambs Racketball Open Competition at Peterborough Squash Club has several grades and Harrow equipment for winners in all categories (Plus cash in the A grade). Six grades A, B, C/beginner, Over 50’s, Ladies and Junior. One day event Saturday May 18 10am – 6 pm (approx), depending on entry level. Entry fee is £10 per grade, £5 only for C/beginners, £5 for second and subsequent grades entered. Closing date for entries is Friday May 10th. Although not a Series event, national racketball ranking points are available from this tournament. Harrow Sports Equipment has very kindly sponsored the competition with good prizes for winners and runners up in all categories. There will be a good cash prize for the A grade competition. Four squash courts maintained in excellent condition. Plenty of car parking space, good changing facilities - food and refreshments available all day. We are the sports club just in front of Peterborough City Hospital, signposted Peterborough Sports Club (postcode is PE3 6UZ for sat nav).